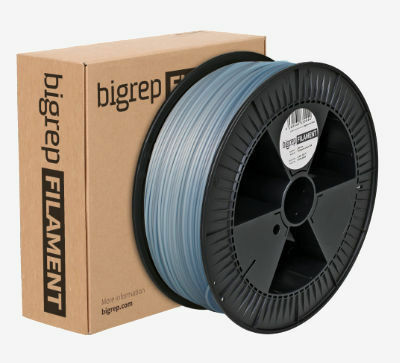 BigRep PVA is unlike any other on the market, this support filament is water soluble. The warmer the water, the faster it dissolves, so you can spend more time creating those tortuous prints and less time refining the results. Moreover, it has been optimised for improved melt flow characteristics, meaning you no longer need to worry about clogging of the hot-end. PVA Poly(vinyl alcohol) is a water-soluble synthetic polymer widely used in 3D printing as support structure which can then be dissolved away. PVA is non-toxic, odourless and easy to extrude. In 3D printing, PVA is commonly used in printers with dual-extruders, like the BigRep ONE, to provide support for an object with overhang issues. Some complex prints involving lots of extended overhangs can only be performed by printing such a support structure. Otherwise, the printed structure would warp or simply collapse. PVA provides high tensile strength and flexibility and it can be dissolved in water, freeing the object from the support structure, so there is no need for manual post-printing curing, sanding, or grinding. At room temperature, the water can begin to dissolve the polymer within 20 minutes and in warm water, the process is usually faster. Contact with water or moisture can dissolve PVA, so it is highly recommended, to keep the filaments dry and well-sealed. Even mild humidity can ruin an unsealed spool of filament. PVA works well together with PLA. PVA extrudes best between 190 and 200°C. Printing at temperatures higher than 200ºC is also possible but is not optimum, the material can begin to degrade, leading to jams in the nozzles that are extremely difficult to remove.